In the latest action against the union-busting low-wage retailer, labor organizers may have finally found a strategy that works. More than a year ago, Walmart spokesman Steven Restivo lyrically told me that the company had changed its relationship with communities, from a “transactional to transformational” one. That had a nice ring to it. Indeed, Walmart had grown more sophisticated about philanthropy and sustainability, voluntarily improving in these areas. But Restivo was not referring to the retailer’s management philosophy. It’s long been clear that the company’s relationship with its workers would never be “transformed” without dramatic action from the workers themselves. Thanks to some brave employees, and a union open to experimentation and real organizing, that action has at last begun. In October, for the first time in Walmart’s five-decade history, workers walked out of stores in Dallas, Miami, Washington, greater Los Angeles and elsewhere, supported by some 200 people who showed up at the company’s Bentonville, Arkansas, headquarters for its annual investors’ meeting. The group mic-checked human resources vice president David Scott, who weakly invited them to meet individually with his department. “We are not here individually. WE ARE NOT HERE INDIVIDUALLY,” the workers politely shouted. “We are here as a group. WE ARE HERE AS A GROUP.” At the heart of the actions is the workers’ demand for freedom of association. The strikers are demanding that the company reinstate employees who have been fired for participating in Organization United for Respect at Walmart (OUR Walmart), a membership organization of current and former workers who hope to improve working conditions at the retailer. They’re also demanding that Walmart stop retaliating against workers who engage in these legally protected activities. OUR Walmart receives dues from its members, but although the group gets funding and assistance from the United Food and Commercial Workers (UFCW), it is not a traditional union. Its structure allows employees to work together and make demands on the company now (not after months or years of fighting for union recognition from an opponent unconstrained by money or law—which generally means never). OUR Walmart formed more than a year ago, as a strategy change for a union whose Walmart plan had veered from traditional organizing to media-friendly corporate campaigns. So far, this third approach—trying new ways to allow workers to take action and organize one another—seems to be working better. It appears unlikely that Walmart can quell this level of unrest easily. Workers in Walmart-controlled warehouses in Illinois and Southern California were on strike for several weeks this fall. The OUR Walmart strikers are back in their stores, but they have told the company that if their demands are not met, Black Friday—the day after Thanksgiving, the busiest shopping day of the year—will be a rowdy one, with strikes and actions at stores all over the country. In an October 8 memo obtained by The Huffington Post, Walmart advised managers that workers have a right to strike and should not be fired for doing so. Indeed, all strikers have so far kept their jobs. Given the company’s history of breaking labor laws first and paying fines later, the memo suggests that, for once, Walmart is at the wrong end of a checkmate: to enjoy full protection of their jobs when striking, the workers have to be protesting an unfair labor practice—in this case the retaliation for joining OUR Walmart. Organizers can now use the memo to reassure workers that if they strike on Black Friday, they won’t be fired. Walmart may raise wages in response to these strikes. 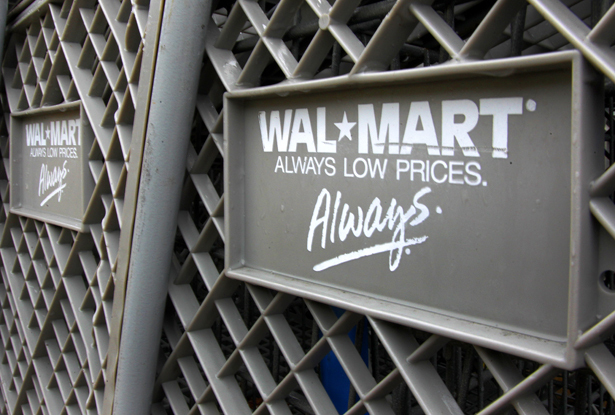 Matt Stoller, on the Naked Capitalism website, reports that according to the Federal Reserve, the last time Walmart faced real labor unrest—in 2006, after the UFCW ran a public education campaign that was far less aggressive than OUR Walmart’s actions—the company responded by raising wages in some 700 stores.